HISTORIC FILM 104 YEARS AGO. – Air La Femme D’Argent | Marbella Marbella – Adelante! HISTORIC FILM 104 YEARS AGO. “You are there” for a cable car ride in San Francisco. This film was “lost” for many years. It was the first 35mm film ever that has come to light. It was taken by a camera mounted on the front of a cable car as it`s travelling down the street. The number of automobiles is staggering for 1906. The clock tower at the end of Market Street at the Embarcadero wharf is still there. 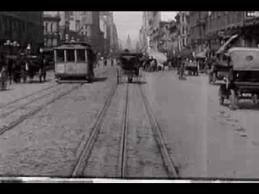 It was filmed only four days before the Great California Earthquake of April 18th 1906 and shipped by train to New York for processing. No wonder there had to be laws created to regulate driving habits. This is insane. Good thing they couldn’t go very fast. This is a fascinating movie. 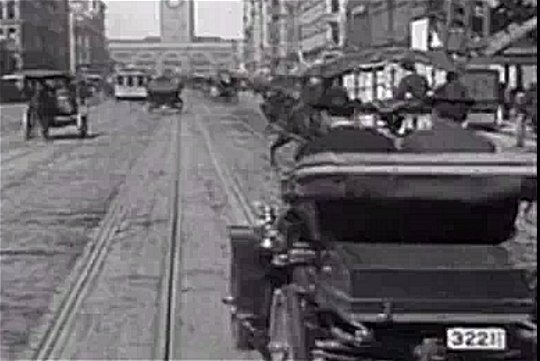 A camera on the front of a street car 104 years ago. Look at the hats the ladies were wearing and the long dresses. See the bullock team on the right near the start. Most of the cars had the steering wheel on the right side, I wonder when they standardized on the left?